How big is your shoe? How does it compare to Paul Bunyan’s size 203 boots? 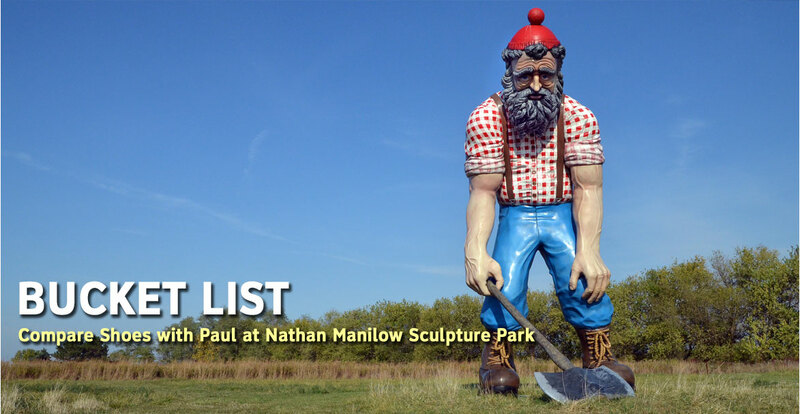 “Paul,” a 30-foot-tall rendition of an older, greyer, Paul Bunyan by renowned sculptor Tony Tasset, towers above the horizon as you walk along pathways among the wild prairie swales. Park in Lot A and walk along Alumni Way past several sculptures until you see “Paul” south of the pathway. From the roving naturalists to classes, camps and backstage experiences, there are plenty of opportunities to interact with your favorite animal. The easiest way to have an animal encounter is to check out the Hamill Family Play Zoo, a kid-friendly exhibit that strives to foster a connection of kids and nature. Check out the Brookfield Zoo website for more opportunities. 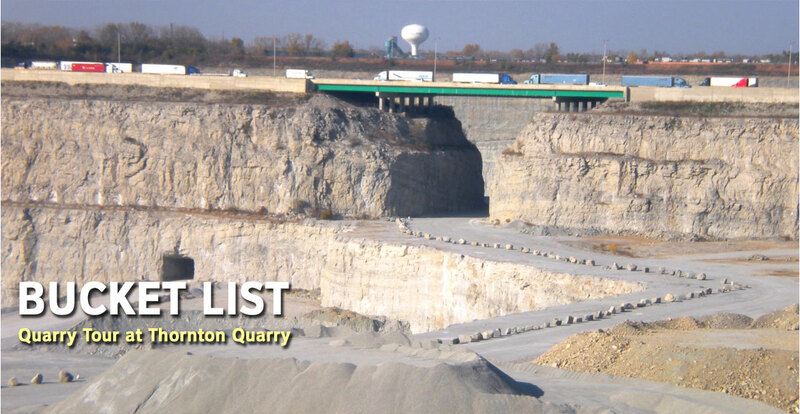 Two tours are offered every year of the Thornton Quarry, the “Grand Canyon of Chicago.” You’ll see one of the largest stone quarries in the world, as you drive over the quarry between the Halsted and Torrence exits on I-80/I-294. The quarry is 400 feet deep, 1.5 miles long and a half-mile wide. 400 million years ago, the area was an inland tropical reef and you can find fossils from the Silurian reefs all over the quarry. Sign up now for one of the tours that happens the 1st Saturdays of June and October. The next open date for a tour is June 2023 through the Thornton Historical Society or contact Seecago Tours (708) 367-0875 for additional tour dates. Take a flying leap onto a cargo net 30 feet in the air, but don’t worry, you are tethered in your safety harness. 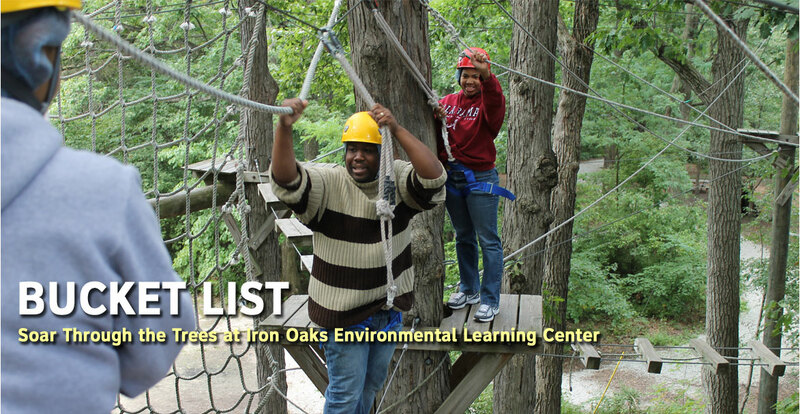 This is one of the many challenges on the high ropes course at Irons Oaks Environmental Learning Center in Olympia Fields. For more high-flying adventures, try their power pole, climbing wall or crate stacking challenge. The best way to experience this is with your family or a group, but you can partake in these events Wednesday and Thursday evenings June-August. Check out their website for more details. With almost 20 home games between March and October, there are plenty of opportunities to catch a Chicago Fire game at SeatGeel Stadium. One of the best ways to enjoy the game is from Section 8 on the north end of the stadium. This group of dedicated fans sing loud and proud at every home (and many away) games. These are some of the most dedicated fans and you are guaranteed to have a great time. A pair of tickets costs about $20 from the Section 8 website.